The 'Brave Magazine', published by Arkansas Flag and Banner, has been asked by the Department of Arkansas Heritage to be preserved in the Arkansas State Archives. Tim Schultz, manager of Imaging and Preservation at the Department of Arkansas Heritage, sent a letter to Kerry McCoy of Arkansas FlagandBanner.com requesting permission to preserve and archive Brave Magazine in the Arkansas State Archives. Brave is a free bi-annual publication that features the heroism of everyday citizens. Brave Magazine was founded in 2013 and the first edition was published in 2014. The feature story in each edition spotlights an individual that “exemplifies courage and bravery” as determined by the editorial staff. Other regular articles include Fun with Flags, American Hero, Travel and Holidays, Food and a 'How to' column. The magazine currently distributes to 6,000 Arkansas customers of FlagandBanner.com. Originally, the magazine was the brainchild of McCoy. It was during the FlagandBanner.com staff meetings that McCoy noticed employees sharing inspirational stories relayed to them by customers. It happened with such regularity, that she began to think about how FlagandBanner.com could share the stories with other people. The idea became Brave Magazine. 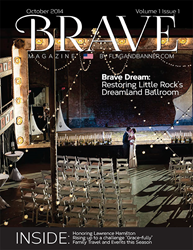 The first bi-annual edition of Brave Magazine to distributed to 6,000 flag customers statewide in Arkansas. It has also been distributed, at times, to larger audiences such as Texas, Tennessee, Rhode Island, New York and other states in the FlagandBanner.com database. Brave Magazine employs a creative writing style focusing on emotional story telling. It will now become a historical part of the Arkansas State Archives, which will be used for students, historians, genealogists and all those interested in researching the history of Arkansas. The magazine will be sent on dates of publication to the Arkansas State Archives for microfilming purposes.